I remember the day my ninth grade English teacher told us that when company came to their house, her mom served jacket potatoes. Their guests had never heard of jacket potatoes, and thought it must be a gourmet dish. 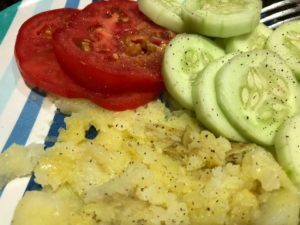 This potato dish is about as un-gourmet as you can get, but it’s simple, easy, practical, and tasty. I couldn’t imagine not knowing about jacket potatoes. 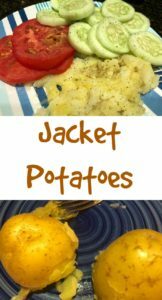 I assume they are given this name because you serve the potatoes right in their jackets. 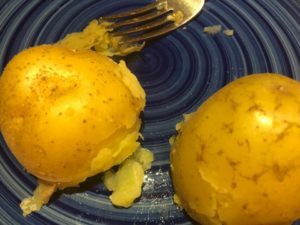 We often had jacket potatoes on Saturday evening for supper, and it wasn’t until later that I figured out why. The jacket potatoes were the first part of Mama’s dutch fried potatoes that she planned to serve on Sunday. She just cooked more potatoes than what she needed for Sunday and viola! provided two meals in one top-of-the-stove cooking. For these potatoes, you’ll just need see through peelings potatoes. Nothing with a thick, touch skin because, if you’re like me, you’ll eat the potatoes, peelings and all. 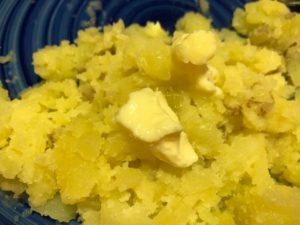 Children enjoy mashing the potatoes and picking off the peelings, and it’s something a child of almost any age can do. Cut the potato in half and place it skin side up. Press down with a fork and watch the peelings lift off the potatoes. Wash the potatoes thoroughly, then cook them in water until they are tender. Remove from the water and let them drain. Serve them right away, because that will make them easier to peel. To serve these potatoes, cut a potato in half. Put the potato on your plate, cut side down. Take a fork and mash the top down. This loosens the peelings and you can pull the peelings off the potatoes and discard them. Or, if you’re like me, you’ll mix those peelings into the potato and continue mashing until they are soft. Add some butter, and season with salt and pepper. Growing up, we often had these potatoes along with corn on the cob and fresh tomatoes and cucumbers from the garden. Sometimes we sliced the corn off the cob and mixed it in with the jacket potatoes. Yumm! With the remainder of the potatoes, you pull the skin off and allow the potatoes to cool. Once they are cooled, you slice or shred them and use them to make potato salad or dutch fried potatoes. A thin-peeling potato can be fixed and ready to serve in just minutes. Add some butter and salt and pepper, and you're good to go.